In the United States Air Force "airlift" usually means fixed-wing transports - C-130s, C-141s, C-5s, C-124s or C-119s. But USAF airlift has also meant helicopters, though the rotary-wing mission has been pretty well hidden from the public eye. But just as the Marines and Army developed transport helicopters, the Air Force did as well. In the mid-1950s Tactical Air Command began developing a helicopter troop carrying capability, using UH-21 twin-rotor helicopters that were drawn from the Air Force at large. Plans were made for eight squadrons, but when the Army ruled against the Air Force's plans - the Army had its own plans for helicopter development - the concept was scrapped and the UH-21s went to various Air Force units for tasks such as the resupply of missile and communications sites. Meanwhile, both the Army and the Marines were developing troop carrying helicopters. The Marine Corps, especially, saw the helicopter as an ideal means of delivering troops onto a beachhead from ships, thus reducing their exposure time. In 1961 the United States became involved in Southeast Asia. Both the Army and the Marines sent helicopter units to South Vietnam to assist the government forces while at the same time testing their capabilities in a combat environment. The Air Force still had helicopters, particularly in the rescue and fire fighting roles, and as the US presence in the region increased, USAF helicopters were sent to bases in South Vietnam. Soon the Aerospace Rescue and Recovery Service's HH-3's, known as "Jolly Green Giants" because of their camouflage colors, were well known for their rescue role. The smaller twin rotor HH-43 Husky was a familiar sight on all Air Force bases where they doubled as fire fighters and for short rescue missions. But the Air Force also was developing helicopter airlift capabilities somewhat along the lines of those of the Marine Corps. The US buildup in Southeast Asia led to the establishment of several remote radar sites in both South Vietnam and Laos. In October, 1965 the Air Force activated the 20th Helicopter Squadron at Tan Son Nhut, and equipped it with CH-3C's. The squadron came about as a result of an Air Force proposal that the service would own and operate all heavy-lift helicopters, including the CH-47s and CH-54s that the Army sought to purchase. Needless to say, the Air Force proposal gave the Army apoplexy. 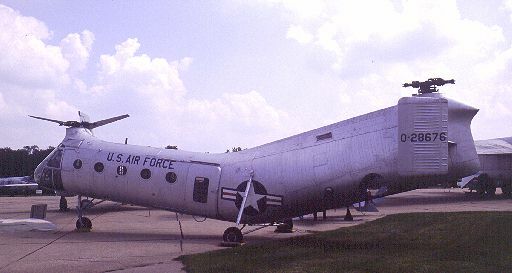 Eventually the conflict was resolved when the Army agreed to transfer all of its CV-2 Caribou fixed-wing transports to the Air Force in return for an agreement that the Army would be responsible for most helicopter development. The 20th was chargd with the task of supporting remote Air Force units and construction sites, and also with aeromedical evacuation and the support of counterinsurgency operations as well as augmentation of the SAR squadrons. Operating from Tan Son Nhut and advanced locations at Da Nang and Cam Rhan Bay, the 20th HS began operations in December, 1965. In early 1966 the squadron was placed under the control of the 14th Air Commando Wing at Nha Trang, and was soon involved heavily in counterinsurgency airlift operations. The Air Force helicopters not only supported USAF operations, they also assisted the Marines in I Corps as well as U.S. Army units in other parts of Vietnam. The 20th HH flew numerous missions for both the Army and the Marines as the two sister services awaited the arrival of their own CH-46s and CH-47s. The Marines would soon get CH-53s, a more powerful derivative of the CH-3. USMC Ch-53s would play a major role in the Battle for Khe Sanh as they delivered cargo to outlying positions around the combat base. The Marines used their helicopters to move troops, position artillery and other tasks in support of the III Marine Amphibous Force. As the Army and Marines began receiving their own heavylift helicopters for use in South Vietnam, the Air Force role shifted more and more toward the support of counterinsurgency operations . Beginning in early 1966, 20th HH CH-3s commenced cross-border operations supplying counterinsurgency teams operating in North Vietnam just north of the DMZ. In 1967 operations into North Vietnam from Thailand were authorized and a detachment of the 20th HH began operating out of Nakonphanom. Eight out of 37 scheduled missions into North Veitnam were completed in 1967. In September, 1967 USAF CH-3s made the first recovery of a counterinsurgency team from North Vietnamese soil. As the counterinsurgency role increased, the 20th received several UH-1s who flew using the call sign "Green Hornet" while the larger CH-3s were "Pony Express." In November, 1970 USAF helicopters airlifted the rescue team to Son Tay Prison, a mission that while successful in that the team landed at their objective and then returned safely to Thailand, it was unsuccessful since it produced now released POWs. Undoubtedly the major USAF helicopter transport contribution was in Laos, where the 20th and a second squadron, the 21st which arrived at NKP in December, 1967 from Shaw AFB, SC, flew missions in support of the Lao forces. A major mission of the two squadrons was supplying remote LIMA sites, where Air Force communications teams operated radar stations. The 21st HH flew armed CH-E's with more powerful engines than the C-models flown by the 20th. The need for increased lift performance led to the procurement of the CH-53; the first CH-53C joined the 21st in August, 1970. USAF and Air America helicopters flew hundreds of missions in support Laotian troops. They also evacuated refugees, especially from the Plain of Jars. When the ceasefire ended hostilities in Laos, the CH-53s remained at NKP to be prepared to evacuate Americans from Laos and Cambodia. Shortly after the Vietnam War ended, USAF Special Operations and Rescue helicopters airlifted Marines to rescue the crew of the Mayaguez, a ship that was captured by Cambodian Communists within days after the fall of Saigon. The Air Force helicopters came under very heavy fire. Eighteen Marines and USAF helicopter crewmen were killed in the battle. Since Vietnam, helicopters have been a major part of USAF Special Operations Forces. Air Force SOF squadrons still fly the CH-53 as well as the newer Blackhawk. USAF SOF helicopters led the Apache strike force who took out Iraqi radar sites to launch DESERT STORM. Click AIRLIFT USA to return.